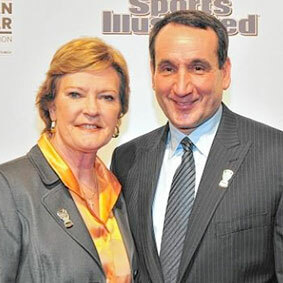 With Duke’s crushing 87-62 victory over upstart Rhode Island in the second-round of the NCAA tournament on Saturday, coach Mike Krzyzewski made history — by recording his 1,099th career victory to surpass legendary Tennessee coach Pat Summitt for the most Division I basketball wins, men’s or women’s. Krzyzewski, a five-time national champion, already held the men’s basketball record for most D-1 wins. The late Summitt coached Tennessee until the end of 2011-12 before early onset dementia led to her retirement, and she died from the disease in 2016. On Saturday, the second-seeded Blue Devils (28-7) put the dark horse Rams (26-8), the Midwest’s No. 7 seed, away early to make their Sweet 16 ticket feel inevitable well before the final buzzer. Freshman star Marvin Bagley led Duke with22 points and nine rebounds, but it was the team’s guards and perimeter shooting — nearly 60% shooting and 50% from three — that put the game out of reach. Outside of veteran guard E.C. Matthews (23 points on four three-pointers), Rhode Island couldn’t find much offensive rhythm all night and coach Dan Hurley’s team bowed out of the NCAAs where it did last year — in the round of 32. The Rams won an overtime thriller over Oklahoma on Thursday in the first round. Effective teamwork begins and ends with communication. Communication does not always occur naturally, and must be taught and practiced in order to bring everyone together as one. The most crucial element of communicating is telling the truth. You have to adapt what you do based on who you are. In teaching, you must remember that no group or individual is the same as who you taught the day before, the year before, or the decade before. Your plan has to suit who you and your team are right now. When you are winning, your commitment is never challenged. But loyalty and dedication during difficult times can be tough. When commitment doesn’t waver, that’s when you have the greatest chance of winning. You can never give up. When you care about someone or something, you show genuine concern for that person or thing, in good times or bad. When you care about one another and about your purpose, you are compelled to put your feelings into action. Care creates an atmosphere that breeds success and gives you the confidence to try again. We win and we lose together. Handling the responsibility for wins and losses together removes the burden from one individual’s shoulders and distributes it among each member of the team. That atmosphere is conducive to high-level performance and places you and your team in the position to be bold and unafraid, and if you should lose, you are not alone. Belief can mean the difference between a fear of failure and the courage to try. On a team or in a family, belief makes each individual stronger and also fortifies the group as a whole. The basis of belief is in individual relationships. You can possess countless good qualities as an individual, but if you don”t have the courage to proceed, you may never see those qualities come into fruition. It takes courage to put what you believe to be best of you on the line, to test it, and to see how far it takes you. Courage means daring to do what you imagine. Take care not to allow one aspect of your life to so consume you that you neglect the others. Balance can put things in perspective, can bring you joy even when you are down, and can allow you to be at your best in all aspects of your life. Adversity can teach you more about yourself than any success, and overcoming an obstacle can sometimes feel even better than achieving an easy victory. Through adversity, you can discover things about your endurance, your ability to turn a negative into a positive, and your personal strength of heart. No matter how successful you believe yourself to be, you can never feel as if you’ve reached the absolute pinnacle. There are always new and wonderful challenges out there, and part of maintaining success is knowing when you need to accept them.